Complete belt revision pack n ° 6. 1 set of 8 rollers ø. 25x14.9 / weight: 18g. 2 candles: bosch ur2cc / ngk cr7e. Yamaha tmax 530 from 2012. This article is assembled on 8 vehicles. 100% synthetic - api sl - jaso ma this 100% synthetic ester based lubricant has been specially developed for very high efficiency engines. Advantages: - extremely high lubricity - reduces friction - withstands the highest temperatures - increases the power of your machine. Choose the delivery method before paying. The processing time of your order can vary 4 to 15 working days, contact us before the purchase !! other thousands of pieces with misterbike-fr. 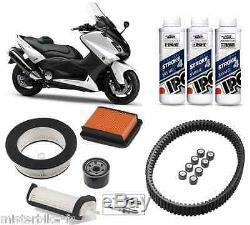 Anti-theft devices, batteries, spark plugs, chain kits, pinions, crowns, chains, clutch discs, air filters, oil filters, fuel filters, oils, engine gaskets, spinnaker gaskets, brake levers and clutch handles, grip pads, jaws brakes, fixed and floating brake discs, brake pads, motorcycle tires, cross and enduro tires, scooter tires, quad tires, inner tubes, lamps and spotlights, wheel bearings and steering bearings, spraychain, turn signals, mirrors, fork tubes, cables, tank caps, handlebars, saddles, bolts, handlebars, valves and stoppers, contactors, workshop saddles, footrests, belts, exhausts, tools, top cases and windshields. Helmets, rain gear, clothing and anti-cold accessories, tire cover, etc. 03.25.55.74.71. Monday to Friday from 9h-12h to 14h-18h. 06.62.69.50.19. Roller: p 14418 / c 483277. Right to 114020o / hfa4610. Left: at 114020l / rm 2490 / hfa4509. Central: 114020i / rm / 2440 / 132.14514 / hfa4507. Candle / 2x ur2cc / cr7e. The item "pac overhaul belt filter oil candles iphone strocke4 5w40 yamaha t-max 530" is on sale since Thursday, February 11, 2016. It is in the category "auto, motorcycle parts, accessories \ motorcycle parts \ other". The seller is "misterbike-fr" and is located in saint-dizier, champagne-ardenne. This item can be delivered anywhere in the world.